When you’re looking for great vegetarian food in Bangkok, one place you need to go to eat is a restaurant known as Chamlong’s Asoke (จำลอง (สันติอโศก). After reading about a cheap vegetarian Thai food court on the Happy Cow website, located near the weekend Chatuchak Market, I knew it needed to be exploited. There was zero complaining when it came to this meal, in fact I tried to spend as much money as possible and because the food was priced so low, everything we ate topped out at 130 THB (about $5). Before entering the vegetarian grazing zone, you just sort of navigate your way to the back of the structure where the main food court is located. Chamlong’s Asoke (จำลอง (สันติอโศก) runs on the coupon currency – meaning you need to exchange cash for paper coupons before ordering your food. We started with 100 THB each and couldn’t even get through all the coupons. Luckily they refund you if your eyes are bigger than your stomach and you don’t spend all the coupons. 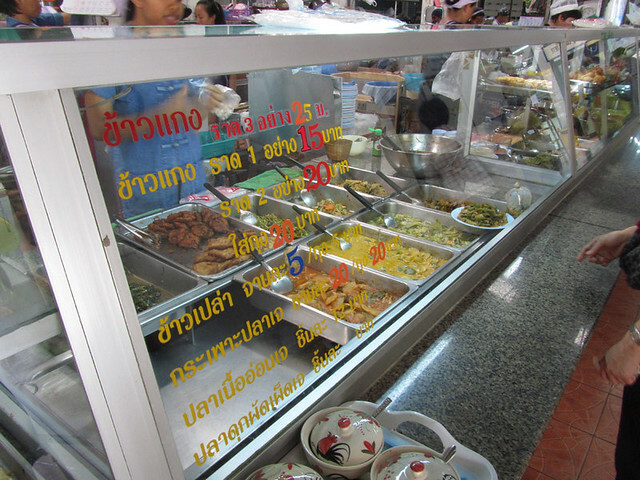 The restaurant is set up with about 10 stalls each serving their own distinct Thai vegetarian dishes. There’s a lot to choose from, and I’d recommend just ordering a few plates that look good. No need to be picky here – everything is pretty good. You can even drink free water. On my latest visit to Chamlong’s Asoke, I tried their kuay teow lui suan (ก๋วยเตี๋ยวลุยสวน), or fresh garden vegetable rolls. 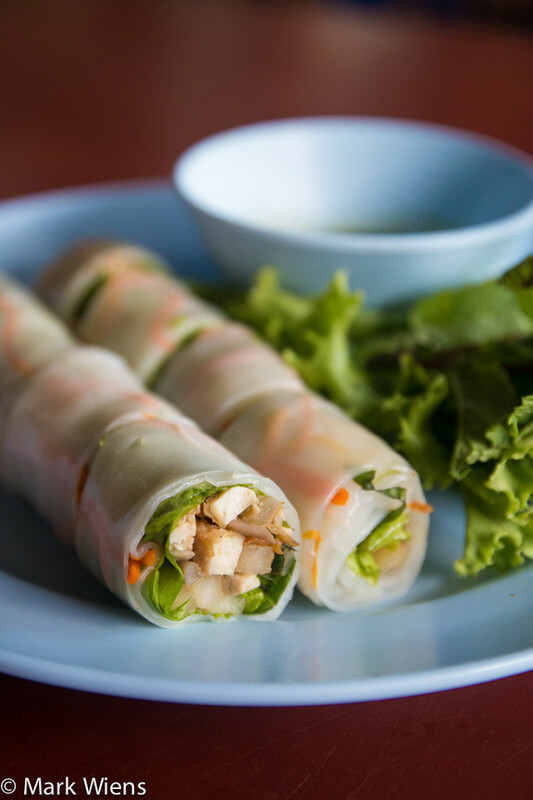 They were wrapped in sen yai, which is the wide rice noodle wrappers, and included a mix of different things on the inside, mostly tofu, jicama, lettuce, basil, and some other wonderful fresh herbs. I loved the nice kick of mint within the rolls, which really gave it a nice refreshing flavor. These little pancake guys, known as por pia sot (ปอเปี๊ยสด) were next in line. A very thin dough wrapped around bean sprouts and other ingredients and covered in a sweet brown glaze. Like I’ve mentioned before, in my opinion mushrooms are probably the best meat substitute. 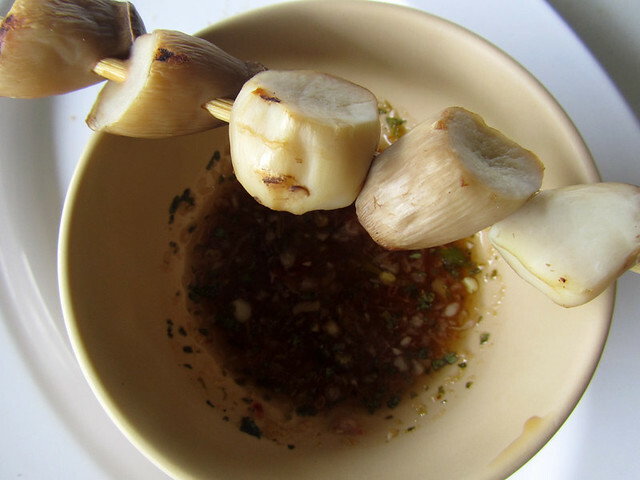 These little skewers of het yang (grilled mushrooms เห็ดย่าง) were off the chain! They were chew and spongy like they should be and the lime infused chili sauce was scrumptious. 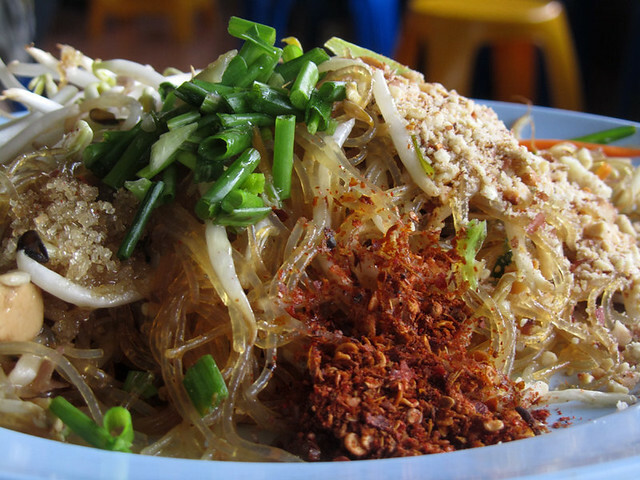 My least favorite of the dishes was a plate of pad thai woon sen (ผัดไทยวุ้นเส้น) – stir fried glass noodles. It was decent and tasty, but lacking fish sauce and a spoon of sugar seemed to be a bit too far of a push (though it was still good). As you see, it was a bit of a vegetarian grazing zone, so my excitement got the better of me throughout the dining experience at Chamlong’s. Could they really have hoy tod (a greasy oyster melt-in-your-mouth omelet)? Yes indeed, except this version was hoy tod het (หอยทอด(เห็ด)), oysters made way for once again, the glorious mushroom. 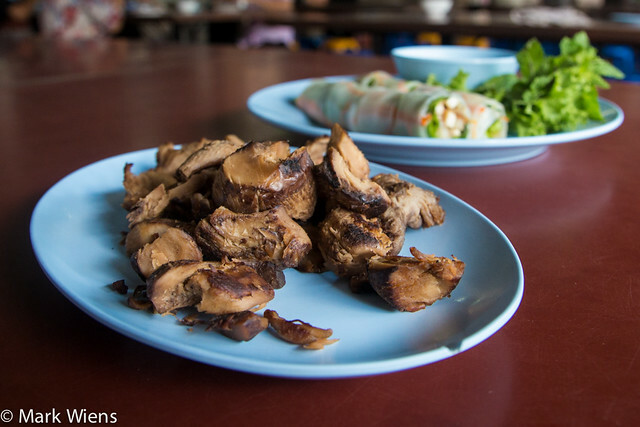 One of the dishes I almost always order at any vegetarian Thai restaurant I go to, is grilled shitake mushrooms, which they call hed hom (เห็ดหอมย่าง). These mushrooms are usually prepared mostly with the stems, so they are literally almost meaty tasting. They have great texture, almost grainy, and are packed with flavor. For myself, it hardly get better for a vegetarian dish than these mushroom. One of the things I enjoy about eating vegetarian Thai food, is that they often have a choice of really good types of brown whole grain rice – which I’m a huge fan of. 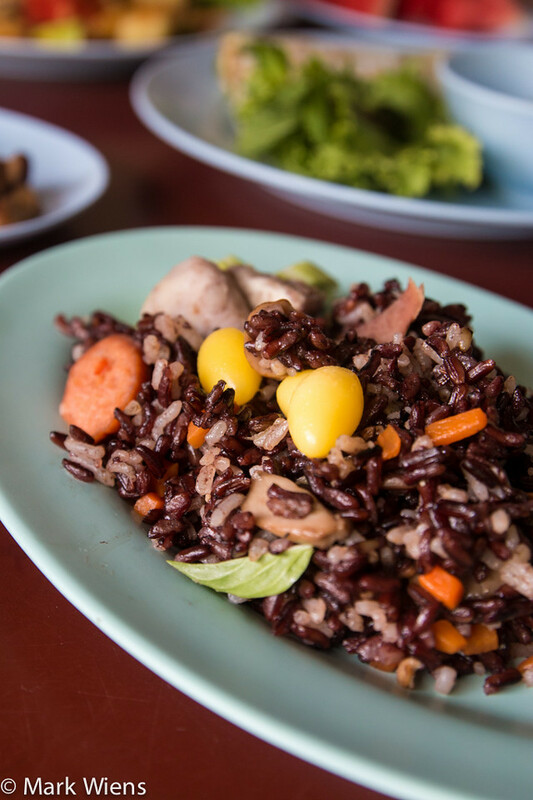 The khao ob puak (ข้าวอบเผือก), which you’ll normally find right in the middle of the food court, is a wonderful mixture of black rice, steamed with pieces of taro and gingko nuts. It went very well with all the rest of the dishes I ordered. If you love rice, don’t miss this wonderful dish at Chamlong’s Asoke (จำลอง (สันติอโศก). 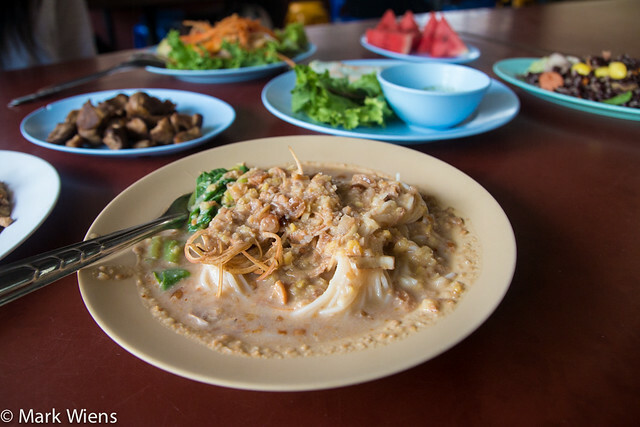 If you’re in the mood for eating some noodles, try the kanom jeen nam prik (ขนมจีนน้ำพริก), soft fermented rice noodles in a nutty sweet curry sauce. My wife ate this dish the last time we went, and she really enjoyed it. 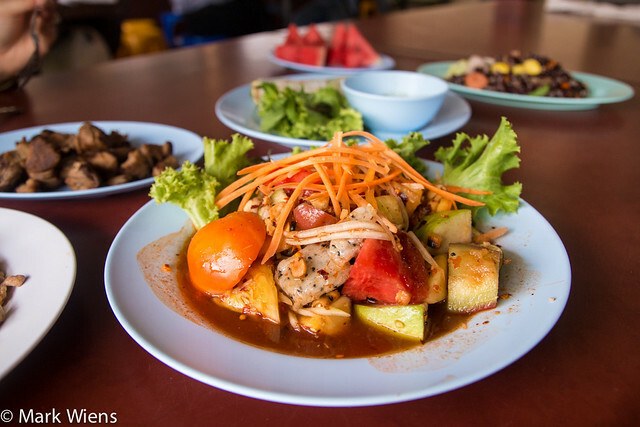 One of my top recommendations for vegetarian Thai food dishes at Chamlong’s is the som tam ponlamai (fruit salad ส้มตำผลไม้). They don’t use fish sauce, because it’s pure vegetarian, so the mixture of fruit is dressed in lime juice, soy sauce, and chilies. It depends on what do you go, what exact mixture of fruit you’ll get in your salad, but usually it comes with dragon fruit, pineapple, watermelon, guava, tomatoes, and a few shreds of extra green papaya. A sprinkle of roasted peanuts gives another nice touch. If you go to eat at Chamlong’s Asoke (จำลอง (สันติอโศก), don’t miss their som tam ponlamai, it’s awesome. 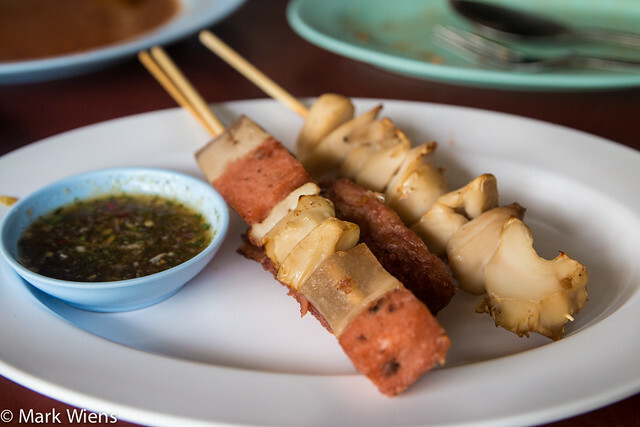 At many Thai vegetarian restaurants, you’ll find that they serve all sorts of fake meats. So for dessert, I decided I needed to try a few skewers of fake grilled meat. The one pictured above is supposed to be pork belly, and you can even see the noticeable different layers of the pig stomach. I have to admit, it was pretty bad, and tasted quite a lot like cardboard. But if you’re curious how it tastes, like I was, you should give it a try too. Chamlong’s is the real deal. Authentic Thai vegetarian food set up into a vegetarian grazing zone with extremely cheap prices. 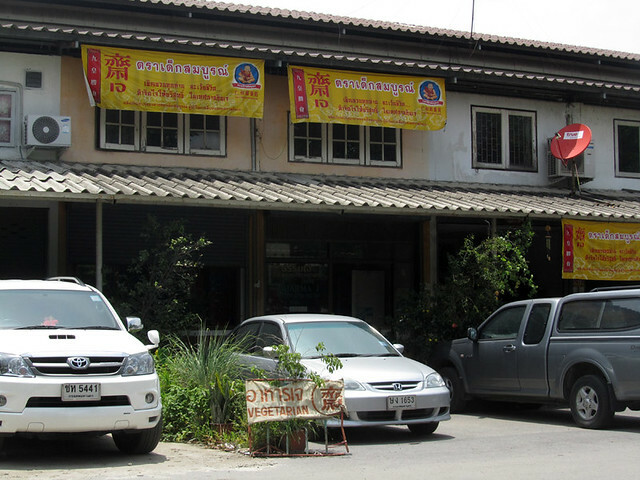 When you are in the Mo Chit Chatuchak area, be sure to check this place out. Chamlong’s Asoke (จำลอง (สันติอโศก) is a convenient, and affordable place to eat vegetarian Thai food when you’re in Bangkok. 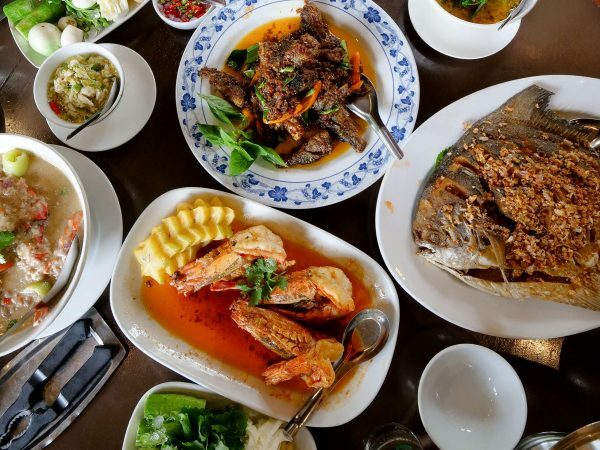 What I really like about it, is that there’s a nice selection of dishes, so you can sample a whole spread of different dishes with different flavors. 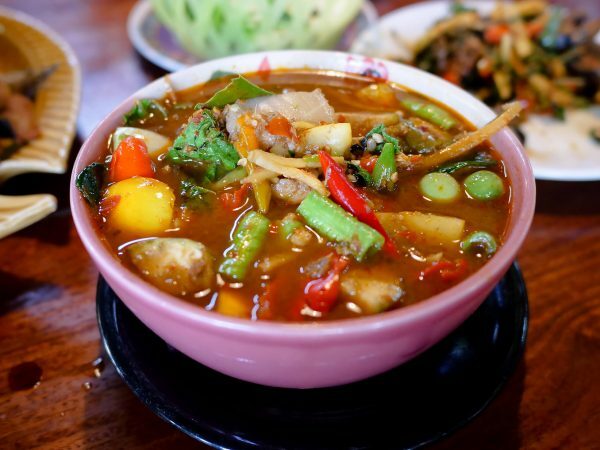 No matter if you’re vegan, vegetarian, or just want to eat some healthier food options, Chamlong’s Asoke is a great restaurant to visit. 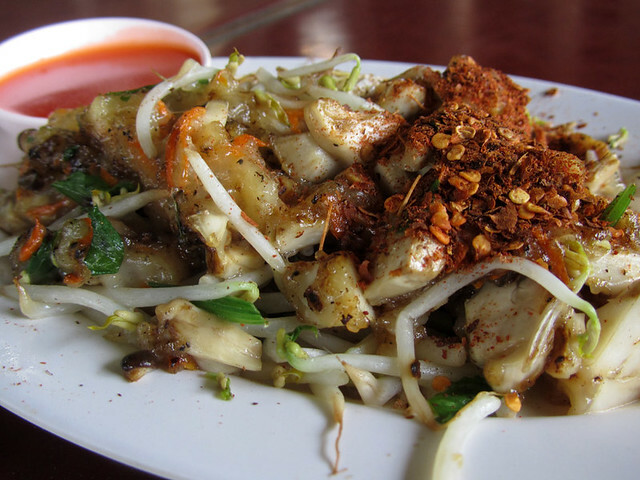 Also, don’t forget to check out our full Thai vegetarian food page here. 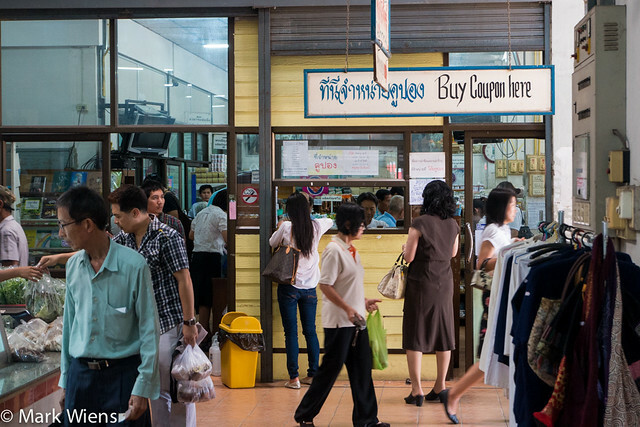 You can either walk from Chatuchak Market, or you can get off at Kampaeng Phet MRT station. Prices: Small things are 10 THB and most dishes are 20 – 25 THB. It won’t break the bank! Read the directions above, because they are doing construction in the area and the streets are changing. Also Thai readers should note this food court is often referred to as ชมรมมังสรวิรัติแห่งประเทศไทย or The Vegetarian Club of Thailand. When I click on the website link, it takes me to–of all things–Harrison Butcher. This must be an erroe. I always go to Chatuchak since I moved here in Bangkok last year but I haven’t tried the vegan food court there. Will definitely ask my girlfriend to go here with me. We’ll let you know how it went. Hi bro . First time visiting bangkok next month and i am a Lacto-ovo vegetarian . Is this restaurant still available ? Haha . Would this vegetarian restaurant be suitable for us ? Does the food contain onion and galric ? Would be staying at chinatown hotel and visiting patunarm market . Any vegetarian food available for us at chinatown or patunarm . Hey Kazuya, great to hear from you. Yes, this restaurant is still thriving and open. It’s fully vegetarian, and I believe it’s “jay” in Thai, so it may not contain garlic. In Chinatown, try https://www.eatingthaifood.com/2011/08/su-ki-jeh-ru-yi-restaurant-bangkoks-senior-vegetarian-hang-out/ it’s a really good vegetarian restaurant. Have a great trip to Bangkok. hi is the food marked in english at chamlongs asoke ? do you know what you will be eating or its only based on visual perception ?? Hi John, hmm, I don’t remember seeing anything in English, so mainly you just have to see the vegetables and ingredients, but at most of the food court each stall sells just one or two things. All the best. Anybody bright enought to put exact coordinates rather than confusing indications? I could ask aournd a bit but most farangs don’t speak Thai… but most people have a stupid smart phone. My friend and I has visited Bangkok last weekend and it’s take us 45min to Chamlong Vegetarians Foodcourt because we doesn’t have the correct and clear direction therefore I am trying to give some advise to those who interested to go there.Firstly walk out from Chaktuchak exit 1 and cross the road to the opposite side which was IN Square Mall now.Then walk to the back of the Mall and you can see the foodcourt right in front of you. It’s so easy to find if someone has given us clear direction. Hello Jacy, thank you very much for the update – I will update the article now. Thank you! Just got back from there, great place – though the directions are a little unclear, due mainly to construction in the area. Just posted up clearer directions with pics, as some of the waypoints aren’t as obvious anymore (the antique store you refer to has closed down, and most of the buildings down the soi have been knocked down, mainly burma workers huts now). Massive help though, as we got lost because another blog sent us to the back of the farmers market across the road for half an hour! Good to hear from you Markus! This is no doubt a great place. I went there on a Sunday at 2.30pm last week and unfortunately, most of the shops were closed. But still one shop was kind enough to serve me a Vermicelli dish and I can say it without second thought that it was the best dish I had in Bangkok for 20THB. I am definitely going again sometime soon to this place but will make sure that I reach there by 12-12.30 so wont be deprived of this feast! Hey Rohan, awesome to hear that, glad you enjoyed this place. 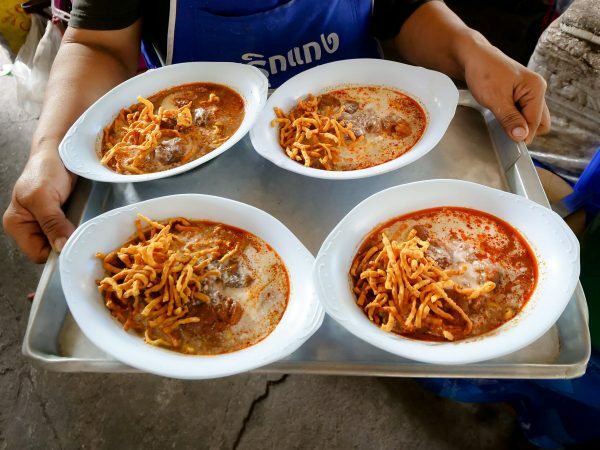 Also, if you haven’t already gone here https://www.eatingthaifood.com/2011/07/baan-suan-pi-aree-bangkoks-best-vegetarian-food-court/ – it’s equally outstanding! I am planning to visit Bangkok during Bangkok Vegetarian Festival sometime around 16-18 October 2012. I will appreciate if you could kindly suggest the best 5 places to visit during these days. I am planning to stay at a hotel in Sukhumvit, say close to Terminal 21. Besides Chamlong’s Asoke, I have thought of May Kaidee as I read a lot of revvs about it. Any other best places for vegetarian Thai? I am an Indian from Mumbai but I do not touch Indian food outside India so oriental vegetarian with different mock meats would be the best to try during the festival. 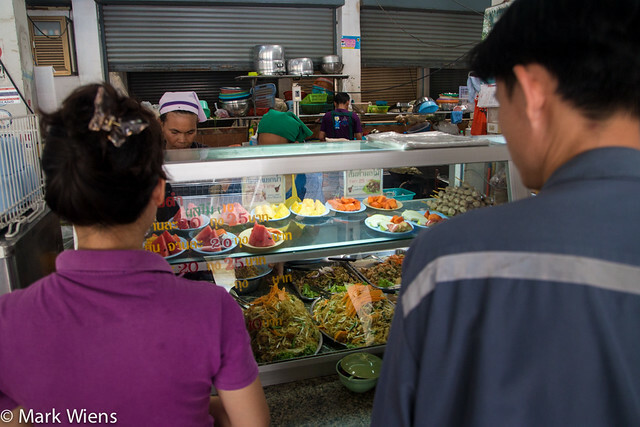 is som tam ponlamai only available on certain day time of the day? No fruit sum tum! We should ask about it the next time we’re there. As far as we know, it’s one of their regular dishes, but something could have changed. Glad you found and liked this place. We appreciate you coming back to give us feedback and appreciate the tip on the fruit juices! I was recently in Bangkok and being vegetarian, I was looking for Jay restaurants. I could not visit Chamlong as I thought this was only open on weekends However I did come across Jay food stalls in Banana Family Park near Ari Station on Sukhumvit line. I was there almost every day for lunch. Great food and you could stuff yourself with delicious dishes and dessert under 75 THB. 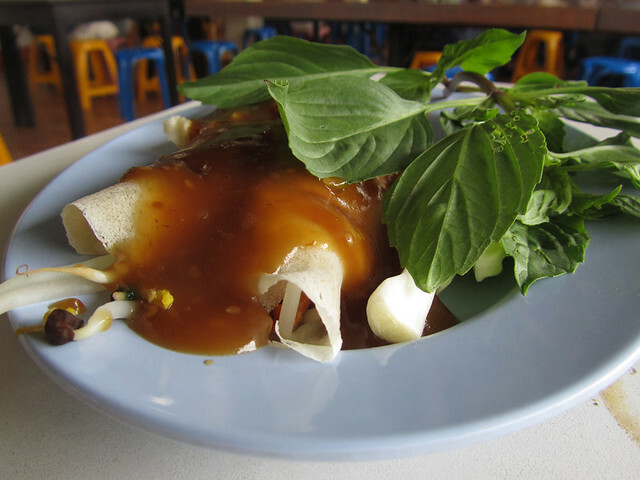 I hope to visit Bangkok soon and would love to try Chamlong. Thanks for your very informative post. Thanks for the comment Kevin! Yes, I’ve been to the food court at Ari BTS station and they also serve some of the best vegetarian cuisine in town! Hope you can return to Bangkok sometime soon to check out Chamlong’s as well. Thanks for the comment Kalvin, We shared an article on Banana Family Park aka Baan Suan Pi a little earlier and we’re in love with that place too. 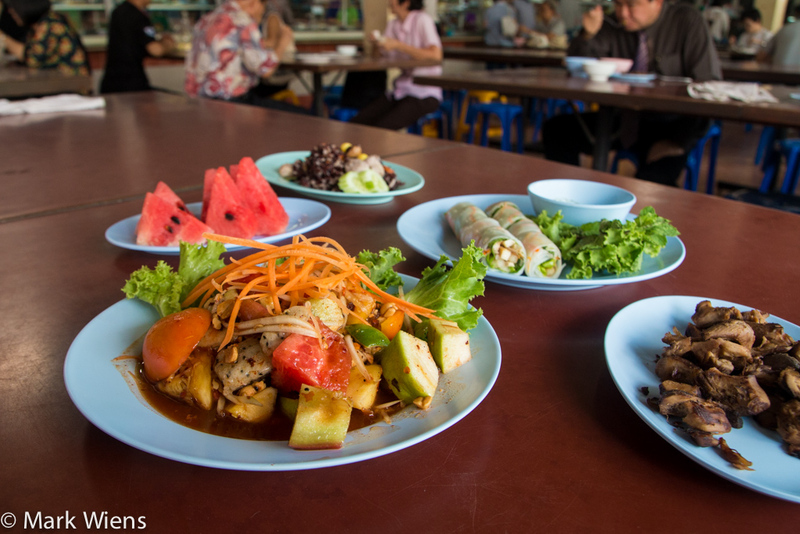 These are must try places for vegetarians who love to feast while visiting Bangkok. Great! 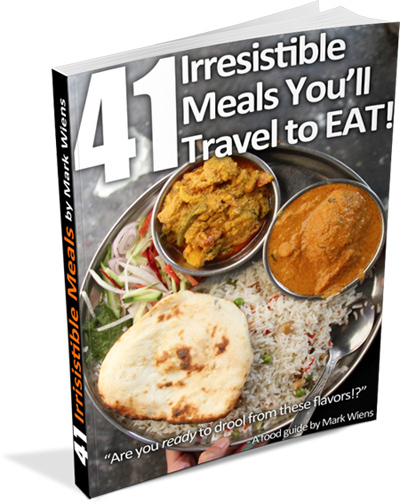 The food really was awesome and I’m sure you will enjoy it! Looking forward to feasting with you guys sometime in the future!